Blood & Sand A sinful blend of Scotch whisky, blood-orange juice, cherry liqeur, and sweet vermouth. This lightly sweet, bright red, and balanced choice is just the thing to vamp up your evening. Find a great one at Comstock Saloon. 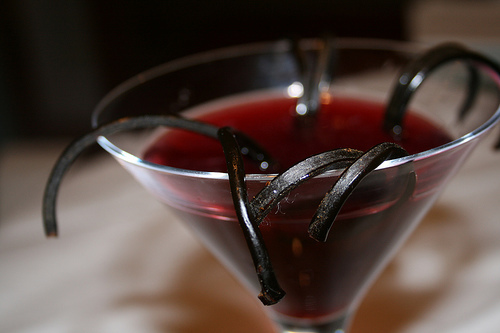 The Black Widow This temptress will put you under a dangerous spell with Blavod black vodka, lime juice,agave, crushed blackberries, and basil. Our friends at Cantina know how to brew this one best. El Diablo Beware this devilish (and delicious!) treat- a combination tequila, lime, ginger, agave, and cassis for a fresh and zingy twist on a margarita. Beretta makes a perfectly evil version. The Corpse Reviver #2 This creepy, yet classic, concoction of gin, Cointreau, Lillet Blanc, and absinthe will raise the dead. A great variation substitutes Square One Cucumber Vodka for the gin, for a cool sweetness that marries perfectly with the licorice-laced absinthe. Don’t say we didn’t warn you though—one too many of these babies and you’ll feel like a zombie long after your night is through. The Alembic shakes up a great one. The Dead Reckoning Our resident pirate, Sam, suggested this one. Private reserve rum, tawny port, pear liquer, chocolate mole bitters- a potion that’ll bring you face to face with the Grim Reaper. Or the ground. For dramatic effect try one at Smugglers Cove in a flaming scull bowl. Whatever mischief you may find yourself in, we wish you a monstrously good- and SAFE- Halloween!